Certified Tourism Ambassador and happy to provide information in planning your holiday with us. Horseshoe Bay Beach is ranked No.1 on TripAdvisor among 31 attractions .This is your view from all rooms and at your doorstep... stroll down the hotel path and you are set to go! Horseshoe Bay beach is crescent shape so wonderful breezes roll up along with the sound of the waves ( louder here on your deck then on the beach). The deck which is 75'x22.5' and includes an outdoor bar, hot tub, bbq and loungers...so room for you all to spread out. The Fairmont hotel is minutes away and you can enjoy 5 amazing restaurants, book a court for tennis or a tee off time, diving or spoil yourself at their amazing spa. The railway trail is also accessible from the home and you can walk, run or bike it and enjoy beautiful views with many areas beautifully shaded with gorgeous flora and fauna of Bermuda.One of the most striking features of the Railway Trail is the mix of new and old in this welcoming environment. As you encounter the twists and turns of the eclectic landscape and seascape, see how nature has carved its mark in our history. You can walk through tall limestone wall-lined paths, perhaps passing an old drawbridge. See where trees have made their own contribution to the foot path, with branches curled over to form a wide tunnel for walking through. Take time to notice the details, and keep an eye out for hidden gems. Find a set of stones leading to the most majestic of ocean views, or a hint of trellis spotted through the trees, belonging to a grand island home. If you can leave the deck the hotel has taxi's always stationed there or rent an electrical two person car from right on the campus (we have a charging station on site for electrical cars)or a moped or push bike also on campus. Bermuda is yours to explore by foot, vehicle or boat each gives its own unique perspective on our beautiful island. We hope you will come and enjoy Bermuda from the ideal location for your vacation!! Kim (owner) was born and raised in Canada but has resided in Bermuda for the past 26 years and is retired from a career in oncology and was previously the coordinator of Bermuda's Hospice. Michael (husband) was born and raised in Bermuda.We have three lovely daughters and they have completed studies in the US, Canada and the UK. Two are presently working at law firms in Bermuda and one in Reinsurance in London. We purchased this property thirteen years ago after considering renovating our previous home or buying something new. One walk through the front door and out onto the balcony answered that question! The only reason to leave this deck would be if the wine ran out or it was bedtime! This view is nothing short of pure therapy but it's free!! This property once seen with its location and views is love at first sight!! You have the world renowned Horseshoe Bay Beach as your view and minutes walk or shuttle away as well as 5 restaurants on campus and many more a short walking distance from the Fairmont property. Additionally there is a spa, golf, tennis and diving,electric car and moped and push bike rentals all on the Fairmont campus. Perfect location for your holiday in Bermuda. Fairmont Hotel is a stroll away and its amenties are an easy walk away. We have the best view on the island of World renowned Horseshoe Bay Vista! We are a short stroll down the Fairmont path to the beach. We are at the end of the golf course so on campus. We have 280 degree views over looking Horseshoe Bay and all the trails. All rooms have reverse cycle a/c. Dryer is on site in the laundry room. Area provided for parking of any rentals. Personal towels and beach towels are provided. Living room is part of the open plan of 756 sq feet. It has a 3 seater sofa and 2 sitting chairs one with ottoman and one recliner. There is a tv located there. We have salt and pepper ,salt, sugar and spices. Paper towel and napkins. Plenty of kitchen dishes for 8 persons and utensils for cooking at home if you so choose. This is a high end finished kitchen with all stainless steel appliances most Bosche. The kitchen is fully equipped for your cooking needs. There is a lovely granite island ideal for food prep. We have an indoor table and and outdoor table for dinning. HDTV with cable in the living room and all bedrooms. Living room and bedrooms all have cable. Speaker for connecting to via blu tooth. Pergola deck 22.5'x 75' large deck with outdoor bar included and lounging space. Hotel has courts that can be booked and walking distance. The hotel has a course again walking distance and tee times can be booked. 6 person 88 stainless steel jet new spa. We can provide grocery delivery info, chefs, and activities and transportation contacts on booking. What an amazing week in Southampton, Bermuda. The Burns’ Southampton home was welcoming and comfortable, providing all our family needed to make Bermuda our home for the week. The welcome reception, accommodations, and location (what a spectacular view) make this a special place to stay. Thank you for making vacation fun and easy for us. We visited Bermuda in off-season and it was just beautiful! Three couples stayed in this unit and it was just perfect!! Gorgeous views off the huge deck overlooking the beach. Kim was the best hostess providing us with information on transportation, grocery delivery, restaurants, etc. The electric cars to rent are literally up the street within walking distance, as well as the hotel if you wish to dine there. We were able to use the hotel shuttles for trips to the beach, but mostly we walked down and took the shuttle back. We were concerned a bit about the weather given it was off season, but it was sunny and 68-70 degrees. Walks on the beach were spectacular and a couple of us even went swimming. Bermuda is beautiful with lush greenery, bluest of water and so pristine everywhere. Would definitely come back and can't imagine staying anywhere else. We had a wonderful time - we needed three en suite bedrooms and they were lovely. The home was situated on a hiill above Horseshoe Bay - absolutely stunning views from the kitchen and lanai! Very comfortable for all - rented bicycles and road along the conveniently located abandoned rail - to nearly each end of the island. Walked the beach for miles - took wonderful hot tubs, grilled dinners, enjoyed the Fairmont property golf course, bars and restaurants, shops, etc.! We enjoyed everyday - and the owners were very helpful and lovely people! It was such a pleasure meeting you and your group. We are thrilled that you truly enjoyed each day to its fullest. We loved having you as guests and truly appreciated the wonderful care you took of our home.Please return again one day for a future visit. Wishing you a wonderful remainder of 2019. Great location, very comfortable place to stay, Kim is a wonderful host. We look forward to returning soon! Arguably the best location in Bermuda! 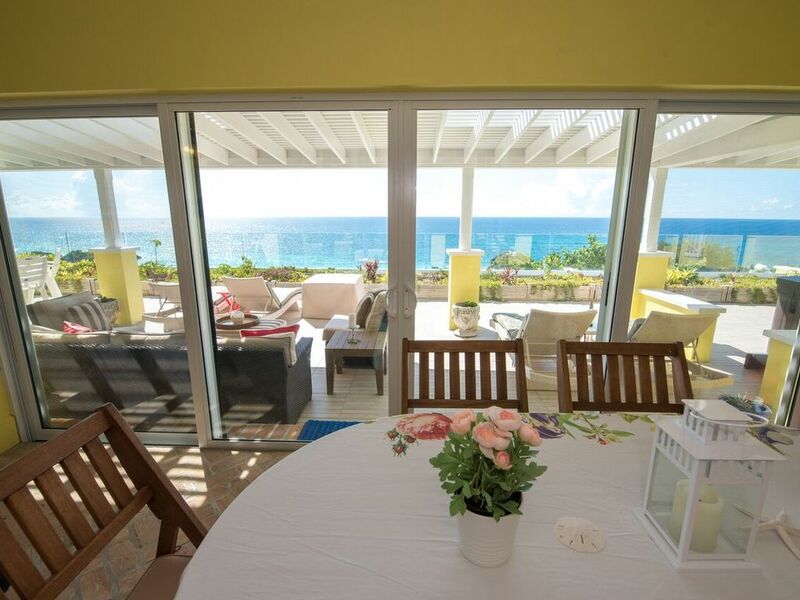 Perched above the middle of Horseshoe Bay and it’s pink sands, Kim has created a home that is welcoming and very comfortable with amazing views of Bermuda’s turquoise waters. The beach is waliking distance along with access to the Fairmont property. The food scene is terrific with great restaurants within five minutes. Want to dine in, shop at Lindos and cook in the chefs kitchen. If you chose to stay with Kim, seriously consider renting an electric Twizzy from Current Vehicles. Their office is two hundred yards away ion the Fairmont property. Kim has multiple charging stations on the property. The electric vehicles give you total access to the entire island on your schedule. A real bonus. You must reserve Twizzys thirty days prior to arrival. They book up quickly. This is a superior property, in an amazing location. Enjoy!!! Thank you so much for your wonderful review and kind words. We would love to have you all back again one day to enjoy another holiday with us.We appreciate the great care you took of our home and taking the time out to do a review. We would highly recommend you to others. Property is everything its advertised as and more. Beautifully appointed, well stocked kitchen and lots of room. Everything we needed for our week in paradise including beach towels, sun chairs, etc. Owners Kim and Mike are the nicest, most helpful hosts you'll ever come across. Would highly recommend this property. Thank you for your wonderful review we truly so enjoyed meeting you and your great friends we hope you will return again for a future holiday. We would not hesitate to recommend you as star tenants who took very good care of our home. Minutes from the Historic Bermuda Railway Trail, spanning 18 miles of walking/biking recreational trail. Direct access to South Shore walking trails. Walking distance to Gibbs Hill Lighthouse which has 360 degree views of Bermuda. Minutes by taxi to Spicelands Ridge Equestrian Centre for horseback trail rides which take you to beautiful South Shore beach trails including sunrise and sunset guided tours. Willow Stream Spa and beauty, tennis, golf, 5 world-class restaurants available at hotel. We also have many tour companies that have an amazing selection of activities to book. We will provide an email out with lots of information for planning your ideal holiday.